Labor Day starts the decline of the boating season. 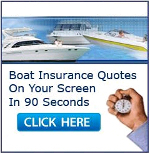 There are fewer people visiting marinas and fewer boats on the water. If you are heading out, you may find yourself alone. With the season changing, so does the weather. As water temperatures cool, fish locations change and fall anglers often roam further offshore. You need to be cautious about quick weather changes. Make preparations to include equipment, clothing, safety gear and preparations for the boat itself. During the fall months, a 40º drop in the temperature can present many problems. A fall day can be so warm, but evening winds often come up, and temperatures fall. This change in temperature can cause outboard engines to freeze. For boats left on trailers, not only can the engines freeze but manifolds often crack which leads to costly repairs. Caution needs to be taken when heading out during fall and winter. With fewer boaters on the water, should you become disabled, there is little chance anyone will be around to assist you. A good rule to follow is leaving a float plan with someone you can check in with when you return. Let this person know where you will be boating, the hours you expect to be on the water, where you will be traveling to and most important when you plan to return. 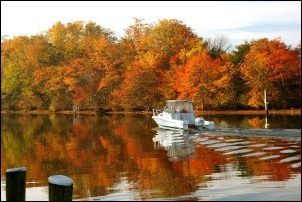 Off-season boating can be a great experience especially with fall colors and the tranquility of quiet, calm waters. Keep in mind though if you need help, it is up to you to get it because there are fewer people around to assist you.